The acupuncture meridians are a system of non-physical energy channels or pathways that run like map lines throughout the body. Hundreds of acupuncture points along the meridians interact with, connect to, and can be used to affect, virtually every organ, system and part of the body. There are two central meridians and 12 major meridians in 7 yin and yang pairs. There are also numerous secondary meridians (The many nerves and arteries that run parallel to, or underneath most meridians are not used in acupuncture.) The central yang meridian starts at the coccyx, runs up the back of the spine and neck, over the head, down the forehead and face between the eyes, and stops at the top of the upper lip just under the nose. The central yin meridian starts at a point just below the lower lip and gums, runs down the front of the body, neck and chin, and stops at the perineum. The 12 major meridians traverse the head, neck and torso, and run down through the arms and hands, and the legs and feet. These major meridians change from yin to yang, and yang to yin at the tips of the fingers and the tips of the toes. Separate microsystems of non-meridian points are located on the scalp, ears and hands, and thousands of extra non-meridian points are scattered throughout the body. These separate microsystems and extra points may be learned in the advanced stages or degrees of Traditional Chinese Medicine. Acupuncturists typically insert needles into the meridian points, usually about 1/8 of an inch below the surface of the skin. 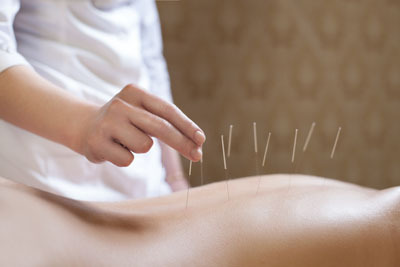 Stimulating various points with needles can produce a wide range of healing effects that include diminishing pain; increasing blood and Qi flow to areas of injury and trauma; improving mood; relaxing the nervous system; opening the sinuses; nourishing the blood; clearing primary and secondary meridian channels; eliminating damp stagnation, and much more. These effects have been the subject of thousands of studies conducted since the 1970s around the world. The studies show that acupuncture does work. Exactly how it works, from a conventional Western medical perspective, is not fully known. But as a result of these studies, we know that needle stimulation of meridian points sends signaling molecules (aka chemical messengers), pain-relieving endorphins and feel-good neurotransmitters (all are considered forms of Qi in Chinese medicine) to various organs and systems of the body, to bones, joints, tendons, ligaments, muscles, etc. These chemical messengers stimulate and activate healing physiological and energetic functions and processes, and even activate stem cells. The differing terminologies and technologies used in Chinese and Western medical paradigms reveal a difference in perspective and approach. Both medical paradigms are valid and effective in different ways. And each one does things the other cannot. Neither paradigm is complete unto itself. Chinese medicine is nature-oriented and holistic. It developed over many centuries as Taoist sages and healers observed the qualities and processes of the human body and the effects of its relational interactions with others, with the components of its living environment, and with the primal forces of nature. It sees and treats the body as a living manifestation of nature, subject to nature’s laws. It recognizes energetic, emotional or psychological imbalance or disharmony as a factor in many physical ailments. It sees these factors as a consequence of excess or deficient; heat, cold, damp, dry, Yin, Yang, Qi, blood, or stagnation of these factors. Its terms include nourishing, strengthening, harmonizing, dissolving, clearing, dispersing and detoxifying. Western medicine is scientific/mechanistic. It developed when the modern scientific/technological revolutions opened access to detailed knowledge of the body’s physical and biochemical components, structures and processes. It sees the body as a marvelous machine composed of interrelated parts, functions and systems, which it often treats separately. In its tendency toward specialization, it often fails to take the interrelatedness of all the body’s parts, functions and systems, and its interdependent relationship with nature, fully into account. Its terms include blocking, inhibiting, removing, suppressing, eradicating, replacing, etc. Ancient Chinese practitioners saw that health and vitality corresponded to the flow of Qi throughout the body. They saw that positive emotions enhanced Qi flow, negative emotions diminished Qi flow, and this had corresponding effects on one’s physical health and well-being. And they found that stimulating certain acupuncture points stimulated the movement of Qi. Releasing Qi stagnation in the Liver can release underlying suppressed emotions and assist in the processing of emotional experiences leading to emotional harmony. Dispersing Qi stagnation can also move the blood and alleviate pain in all sorts of situations from PMS to injuries. To develop these 3 levels of skill to the point of mastery, practitioners must learn the knowledge and techniques of acupuncture. And as each practitioner is a vehicle through which diagnosis and treatment occur, he or she must also develop or cultivate the following vital qualities, or essential tools: Awareness; Qi; Intuition; and Equanimity, or emotional/psychological balance. Just as the ancient Taoist healers did, many dedicated acupuncturists practice disciplines to cultivate and increasingly embody these qualities, knowing they are as important to a healer as medical knowledge and skillful technique. These disciplines include meditation, Tai Qi, Qi Gong, martial arts, yoga, dance, and other more contemporary practices. In the Chinese medical paradigm, maintaining health and vitality, cultivating Qi and other “spiritual” qualities, is the path to longevity and even the secret of immortality. For several millennia or more, master acupuncturists who embody these qualities have been revered into their elder years. Such master practitioners can do extraordinary things with tiny needles. Some hospitals in China anesthesiologists use acupuncture in place of general anesthesia. In the 1970s, President Nixon went to China and viewed doctors performing brain surgery using acupuncture anesthesia. This brought acupuncture to the world’s attention and brought Chinese Medicine to the west. Today Acupuncture is licensed and practiced throughout the U.S. and Europe. Request an appointment here: https://marinoptimalhealth.com or call Marin Optimal Health at (415) 200-1291 for an appointment in our San Rafael office.